We had a great day on Saturday at our Annual Celebration in Stirling. Over 60 people from across Scotland joined us to celebrate the impact of people who stood in the G.A.P. for people affected by leprosy in the last year. The theme for the day was “Leprosy Defeated: How? When? Why?” and different speakers and workshops focused on aspects of what Leprosy Defeated will mean in the countries where it is still prevalent and what it means for us here in Scotland who are passionate to see it happen. 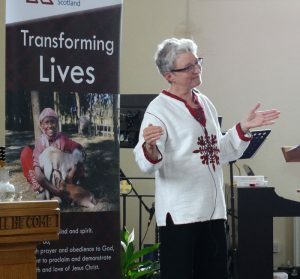 Catherine Benbow, who served The Leprosy Mission in India, Ethiopia and Timor Leste and now as a board member in England and Wales, spoke passionately about how defeating leprosy means going much further than just eradicating the bacillus, though that will be hard enough. It also means tackling the stigma, prejudice and mistreatment of people affected by leprosy everywhere. And it means enabling people to live safe and productive lives. Linda Todd challenged us all to see Scotland play it’s part in the drive towards defeating leprosy. To reach the big goals and complete task before us, we will need to find more givers who will give more money. We will need more people to take action in their communities. We will need more pray-ers praying more prayers. It is exciting to think that the end might be in site within most of our lifetimes but if we take our foot off the gas and try to coast to the finish we’ll never get there. 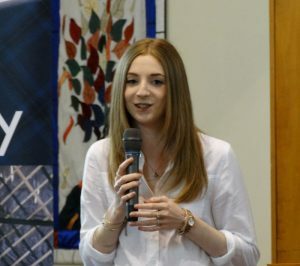 Linda also introduced Emma Bean, a medical student from Glasgow University who will be spending 4 weeks at Anandaban Hospital in Nepal later this summer. We sent her off to Nepal with our prayers and blessings. Stuart McAra and Tim Reed shared stories from their recent trips to India & Myanmar and Nepal & Bangladesh. Stories of people who are being supported right now to defeat leprosy and its effects in their lives. In a surprisingly popular session (it had to be moved into a bigger room), Kevin Dillon gave an update on some of the latest research going on around the world into different aspects of leprosy, its treatment, transmission and prevention. Mhairi Dawson encouraged us to think about the different ways that it is possible to volunteer to defeat leprosy. We also celebrated the work of all of our volunteers as part of national volunteers week. 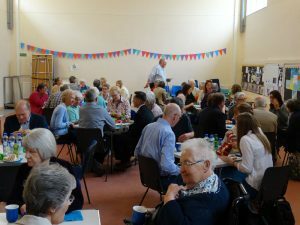 The day started and ended with short times of worship, there was time for prayer and great fellowship over lunch and afternoon tea. It was an inspiring day. Keep an eye out for details of next year’s celebration and aim to join us if you can.